He belongs to an increasingly rare breed of sophisticated, literary publishers. And every day, since the beginning of this century, he has watched in despair the spectacle of the noble branch of his trade – publishers who still read and who have always been drawn to literature – gradually, surreptitiously dying out. There are fewer and fewer “genuine writers and talented readers” to make it worthwhile, a decline Riba ascribes to “the golden calf of the gothic novel”, which created “the stupid myth of the passive reader”. Riba dreams of the return of readers with a capacity for “intelligent emotion, a desire to understand the other and to approach a language distinct to the one of our daily tyrannies”, but he knows it is unlikely to be realised. The younger publishers are keen instead to exploit the “the ‘new language of the digital revolution’, so useful for covering up a lack of imagination and talent”. Yes, it's time for Riba to retire. Actually, he finds it liberating to be free of the “vampire tales and other nonsense now in fashion” and “no longer to waste hours reading so much rubbish: manuscripts with conventional plots, stories that need a conflict in order to be anything”. Only he regrets not having resolved his lifelong obsession, to uncover an authentic literary genius. He believes the writer is still out there: “in the shadows: in solitude, in doubt, in question”. There is a dream he can realise however, and that is one he had while seriously ill, caused by years of alcohol abuse. He dreamed of Dublin, “a city he had never been to, but which in the dream he knew perfectly well, as if he'd lived there in another life”. That other life is, of course, reading. He has absorbed James Joyce’s Ulysses as a vampire absorbs another's lifeblood, just as Joyce absorbed Homer. As is only natural for someone who has a “remarkable tendency to read his life as a literary text”, Riba decides to hold a funeral for the Gutenberg age of print in the very same chapel that in episode six of Ulysses saw the funeral of Paddy Dignam. If literature is dying, then a funeral must follow. Literary interconnections fabricate his story: Gutenberg’s funeral aligns itself to Dignam's as it was itself aligned to Odysseus’ descent into the underworld. Riba is fascinated by the stranger wearing a macintosh encountered by Bloom at the funeral, perhaps because he too often sees mysterious strangers: a man wearing a Nehru jacket staring at him from the street outside his parents’ home, who Riba then spies again on his taxi ride home. What does he signify? Is there a connection? Perhaps his fascination with Ulysses agitates excessive awareness. He wonders if Nabokov is right that the man in the macintosh is Joyce himself, a portrait of the author as friend to the dead. To distract himself, Riba reads a newspaper and happens upon an article featuring comments by Claudio Magris, an author he has published, who argues that Odysseus’ circular journey home was replaced halfway through the twentieth century “by a rectilinear journey: a sort of pilgrimage, a journey always moving forward, towards an impossible point in infinity, like a straight line advancing hesitantly into nothingness”. The correspondence is clear as Riba is himself on his way home in the taxi, reiterating Joyce's achievement in applying Homeric reach to the absolutely mundane, this time taking it further towards that nothingness; his own. Not that Riba is entirely happy with this literary web spinning, aware perhaps that it is the intellectual equivalent of alcohol ingestion; an induced reverie with damaging consequences. But then it follows that if the everyday of the reader proffers literary correspondences, adding a certain portentous grandeur to ordinary life, the end of literature will mean life disrobed and destitute, leaving him to endure what we might call enchantment hunger (which someone ought to use for a title). When Riba sees a strange suitcase in his Dublin hotel room, he recognises it is an appropriate incident for a novel, but he doesn’t want to be written by novelist of some cheap, conventional fiction. At the funeral, he sees a young man nearby who looks remarkably like a young Samuel Beckett, the “direct and essential heir” of Joyce. Riba now becomes obsessed with him. Could this stranger be the authentic genius to bring Riba and the Gutenberg age back to life? Of course, following Nabokov, the Beckett figure could be Vila-Matas himself, this millionaire of books and stories (to adapt Borges’ description of Joyce), and thereby Riba’s undiscovered genius. This would certainly deliver a redemptive twist to his sad tale and give his apocalyptic sensibility not only a splendid fictional veneer but necessity. 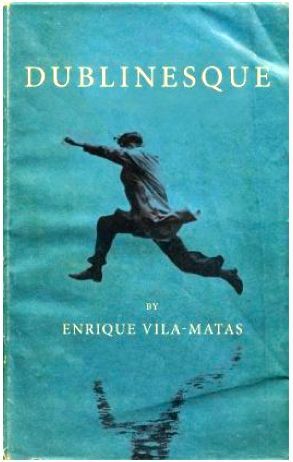 Dublinesque – which is translated from the Spanish by Rosalind Harvey and Ann McLean – is so lightly ironic in this way that it may be dismissed as the densely woven floss of literary candy; it shares not only the title of Philip Larkin’s poem describing a funeral procession but also its sentimental grace. Yet such fairy-tale simplicity and lightness veils the precise patterning of a novel in which every gossamery sentence describing every ghostly event is thread OuLiPo-like through the eyes of a thousand literary needles. Sometimes I wonder if deployment of such dazzling skill is merely that, with too much knowing producing only a warm, colourful rug over the frozen sea rather than a glistening axe. But this is Joyce land, not Kafka. When Borges introduced the great writer to an Argentine audience in 1925, he characterised himself as a traveller and Ulysses as a new land, confessing to not having cleared a path through all of its pages. In the meantime, he said “let us admire the provisional miracle”. In solitude, in doubt, in question, I suggest we do the same with Dublinesque.